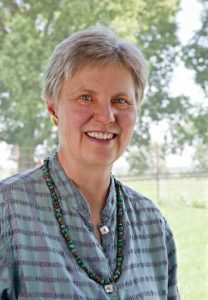 On Thursday, February 22, 2018, Iowa Poet Laureate and BEI Emeritus Fellow Mary Swander will read, discuss, and maybe share a banjo tune! Admission is free because this event is funded by Humanities Iowa. Come along from 7:30 pm – 9:00 pm at the Orpheum Theater Center, 220 E. Main St., Marshalltown, IA. If you are a person with a disability who requires special assistance, please call the Orpheum in advance. The Orpheum Theater Center has received funding from Humanities Iowa, a private, non‐profit state affiliate of the National Endowment for the Humanities, to host this presentation. A cultural resource for Iowans since 1971, Humanities Iowa offers many cultural and historical programs and grants to Iowa’s communities.